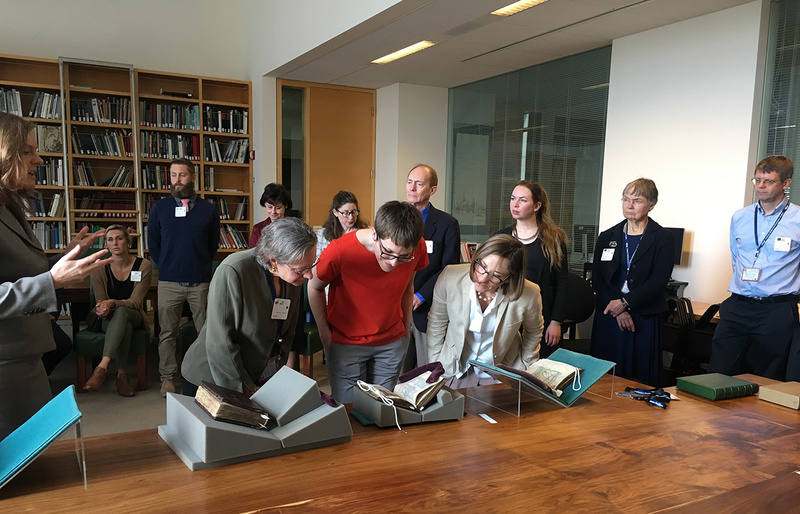 On March 3 and 4, UCLA’s Center for Medieval and Renaissance Studies and the J. Paul Getty Museum’s Manuscripts Department hosted scholars from across the United States and abroad for an interdisciplinary symposium, The Ark After Noah: Books, Beasts, and Bodies of Knowledge. Generous support was provided by the Endowment for the UCLA Center for Medieval & Renaissance Studies and Brian and Katherine Stokes. 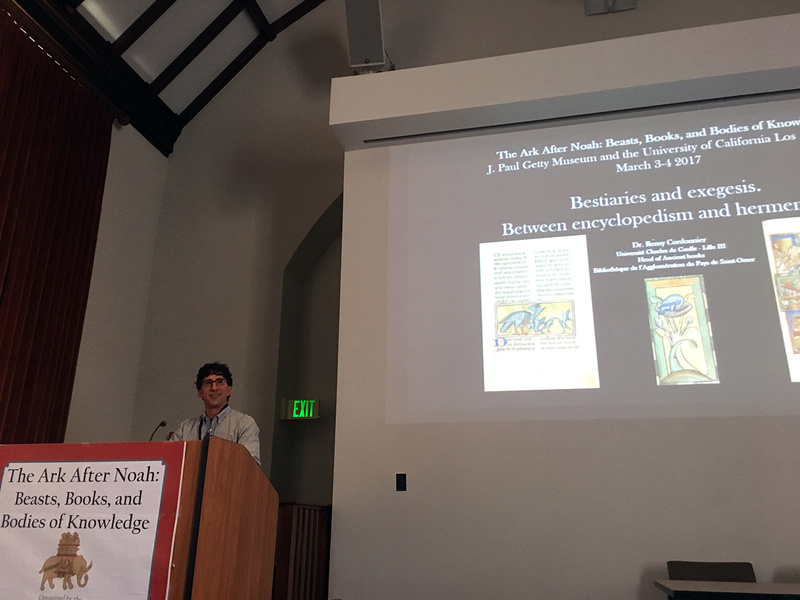 Across the two-day gathering, conference participants presented research related to the medieval bestiary and its legacy. In a broad conception, a bestiary is a collection of stories about animals—including land creatures, fish, birds, and serpents—whose properties and behaviors were interpreted as symbols for God’s divine order. Manuscript texts elucidated each beast’s behavior and characteristics within a Christian theological framework. The bestiary was also one of the most popular illustrated texts of the High Middle Ages and has a rich manuscript tradition of lavish illuminations. Stories and images from the bestiary found their way into many other aspects of medieval art and life, including other textual genres, visual expressions, and literature. Scholars invited to speak at the symposium were encouraged to look at the origins and the development of the bestiary itself, but they also cast a wide net and examined the bestiary’s influence on other texts, images, genres, and philosophical traditions. Symposium participants included historians, specialists of medieval literature, and art historians, creating an interdisciplinary dialogue. Presentations interrogated key aspects of terminology and challenged traditionally held assumptions about the medieval bestiary and its influence, working to advance our understanding of a complex and multifaceted textual and visual tradition. For me, as the 2016–17 graduate intern in the Manuscripts Department, the symposium presented a wide variety of insights into an exciting field of inquiry. 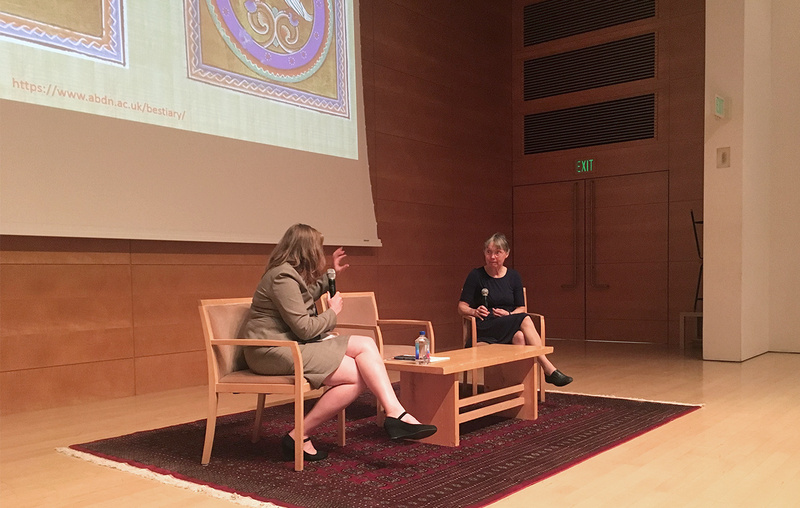 I approach the study of bestiaries from an art historical perspective, and it was enlightening to hear both art historians and specialists from other fields engage the questions of the bestiary and its connections to many other textual genres and visual traditions. The synopses that follow reflect my impressions of each of the presentations and the academic tone of the gathering, in which speakers were encouraged to engage with each other and dive deeply into complex issues related to medieval texts and images. What is a “bestiary”? Should the term “bestiary,” which modern scholars have applied to a wide variety of texts and types of manuscripts, be narrowly defined or evoke a looser grouping? What was the purpose of medieval bestiaries? What audiences engaged with them and how? How should we think about the idea of “genres” in medieval texts? 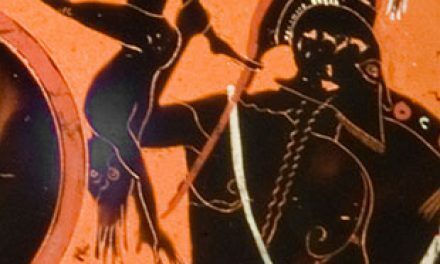 To what genre(s) do bestiary texts and images belong? To what extent are bestiaries “encyclopedic”? How do bestiaries fit into the development of encyclopedic texts in the Middle Ages? How did bestiaries classify and organize information? How did the contents of the bestiaries interact with medieval literature and other types of secular texts? On each morning of the conference, co-organizers Elizabeth Morrison and Matthew Fisher provided a framing presentation that investigated an animal case study in order to introduce the issues and themes of the symposium. Morrison, senior curator of manuscripts at the Getty Museum, traced the legendary unicorn from its inclusion in the medieval bestiary and subsequent appearance in various media throughout the Middle Ages, illustrating the widespread use of bestiary stories even outside of the manuscript tradition. On Friday morning, the conference began in Royce Hall on the UCLA campus. Speakers on the first day engaged the questions of uses of the bestiary, problems of interpretation and translation, and relationships between the medieval bestiary and other medieval texts. Classification and Taxonomy: How Do Bestiaries Organize Information? To begin, Susan Crane confronted the question of classification and taxonomy in a group of bestiaries known as the “Second family”—the largest and most well-known group of bestiary manuscripts, many of which were produced in England during the thirteenth century. Using the manuscript Bodley 764 (c. 1225–50; Oxford, Bodleian Library, University of Oxford) as a case study, Crane suggested that the methodological “ontological turn” in the field of anthropology might offer new possibilities for the interpretation of the bestiary that can accommodate its heterogeneity. Pointing out that many of the animal behaviors in the bestiary do not have a spiritual gloss, Crane argued that scholars should embrace this heterogeneity. She suggested that bestiaries instead describe several different ontologies, what she termed “models of being” that coordinate material life (analogism) and consist of the interaction of minds (animism). She argued that analogist and animist motivations underlay many of the Second-family bestiary entries, and that by shifting our modern view from the idea that bestiaries simply presented a physical and spiritual taxonomy to a model recognizing the operation of several different simultaneous ontologies within them, we might begin to reevaluate the function of bestiaries in medieval intellectual life. Three speakers on the first day engaged with the question of the extent to which the bestiary should be considered encyclopedic and with related issues of the usage of the bestiary’s texts and images for classification, teaching, or spiritual contemplation. Rémy Cordonnier examined the text of the Aviarium of Hugo de Fouilloy, a French monk of the twelfth century. The Aviarium has often been considered a type of bestiary, consisting of a moralized treatise on birds in much the same way that a bestiary provides moralized tales for each of its animals. Much of Hugo’s text is scriptural exegesis, drawing on the Bible as well as the Physiologus. Cordonnier explained how the first set of images in the Aviarium offer views of ideal behaviors in monastic life, illustrating how the messages in the Aviarium texts were deeply rooted in the pursuit of religious salvation. He then argued that there were actually two different textual traditions in the bestiary: the Physiologus, which was concentrated on Biblical exegesis, theology, and a reading of God’s message in the natural world, and the bestiary itself, which was more focused on hermeneuticism, encyclopedism, and an explanation of animal properties to help understand Biblical metaphors. Emily Steiner later picked up the thread of encyclopedic uses of bestiary texts, examining Bartholomeus Anglicus’s thirteenth-century text De proprietatibus rerum (On the properties of things) and its subsequent translation into English by John Trevisa. 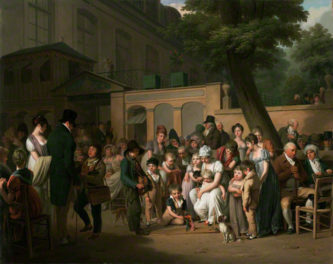 Steiner argued that Trevisa’s translation of De proprietatibus rerum, known to modern scholars from a small corpus of surviving manuscripts, cultivated a style of writing that explored the emotional life of animals and plants in excess of what the “encyclopedic” subject matter would seem to demand. She outlined the aspects of the creation of a literary prose style in the realm of an encyclopedia: frequent comparisons of animal bodies and human bodies, a stripping of moral parts of the bestiary material, and an investment in the senses and emotional affective response of the reader. She concluded that the anthropomorphizing of animals and the creation of an emotional likeness between animal and human subjects enhanced the ability of medieval authors to classify animals. The development of an elaborate prose style in the encyclopedic mode added artistic flourishes to the text much as the illustrations did in the French manuscript versions of the text from which Trevisa drew. Rebecca Hill also engaged the question of classification and the place of animals in divine and natural orders, but in the Arabic “bestiary tradition” instead of the Western European context. Hill first established Qu’ranic sources about animals: an explanation of the Flood, which says that every being that survived on the Ark of Noah was meant to be saved, and that everything praises Allah in its own way. She examined the debate surrounding the elephant and spider Qu’ranic suwar as it played out in several Arabic sources that compile animal lore and are inclusive of animal natural behavior, folklore, and religious significance. The texts of writers Al-Jahiz, Al-Qazwiri, and Al-Damiri make up the corpus of texts that we might call Arabic “bestiaries,” though Hill pointed out in the Q&A that the use of that term in non-Western contexts presents conceptual problems. These texts combine elements of natural science, medicine, proverbs, and the Qu’ran to catalog, explain, and contextualize animal behavior. Matthew Fisher introduces Rémy Cordonnier’s talk on day 1 of the symposium, held at UCLA. The other three speakers on the first day examined relationships between the bestiary and other medieval texts. Alexandra Paddock engaged the bestiary whale, and specifically analyzed the relationship between the whale as presented in the bestiary text of the late-thirteenth-century Arundel Ms. 292 from the British Library and the Biblical story of Jonah and the Whale in a late-fourteenth-century literary poem in English about the virtue of patience. Arguing that the anonymous poet of Patience had a knowledge of the bestiary material in Arundel 292, Paddock asserted that the poem presented a case in which the whale body worked in a certain way that was not as easily distinguishable between spiritual and physical as the bestiary was. In bestiaries, the whale’s appearance in images was variable, but its behaviors were consistent and defined. In Biblical sources, such as the story of Jonah and the Whale, and in the Patience poem, the whale’s body and the sea are conflated as unstable and a hostile space for humans. The Patience poem offered a reworking of the Jonah story to concentrate on the phenomenology of the whale’s body as an environment, and a symbol for Hell. Baudouin Van den Abeele spoke to the group about medieval hunting texts and their parallels in the medieval bestiary. Bestiaries often featured scenes including hunters or describing hunting, since this was one of the primary modes of contact between humans and animals. Van den Abeele concluded that hunters in bestiaries are often symbolic stand-ins for the Devil, Hell, or Judas. He then turned to a comparison between hunters in bestiaries and those that appear in hunting treatises, which form a distinct manuscript genre. He noted that the text of hunting treatises is very precise, but that illuminators of the texts sometimes took artistic liberties in the exact depiction of hunting gear and clothing. Bestiary hunters, on the other hand, seem to be imbued with more symbolic aspects: they carry axes though no actual medieval hunter would have done so, and blow upside-down hunting horns, for example. He concluded that there could be links between bestiaries and illustrated hunting treatises, but that bestiaries use images of hunting and hunters for far more symbolic means. Emma Campbell also treated the issue of different kinds of bestiary texts, engaging questions of language and translation in French verse bestiaries. 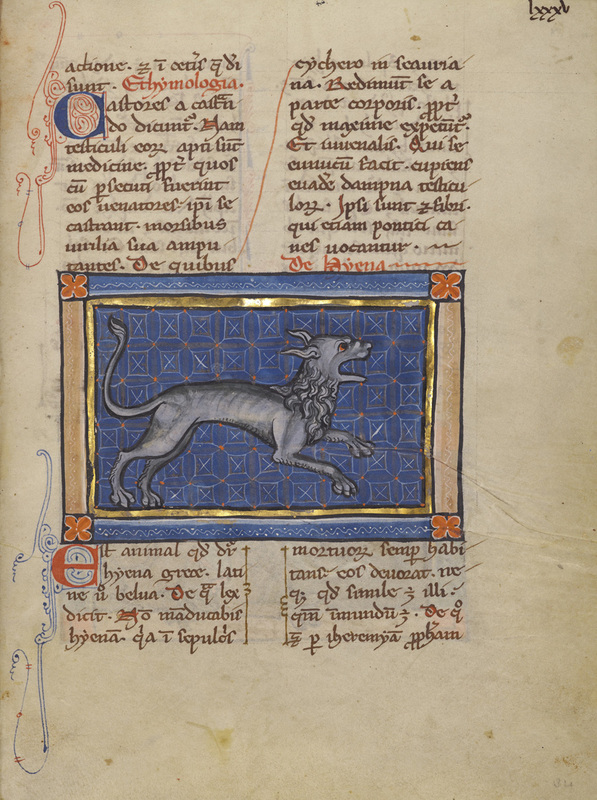 While the bestiary is principally known as an English phenomenon, translators also created French versions in verse during the late-twelfth and early-thirteenth centuries, which form their own distinct but related manuscript tradition. Campbell examined surviving manuscripts of the translation of Philippe de Thaon, the author of the oldest French verse bestiary, whose work exists in only three manuscripts, and Guillaume le Clerc, whose work is the longest French verse bestiary, and is extant in about twenty-four manuscripts, many of which are illustrated. Campbell analyzed the strategic use of Latin within the French translations, noting Guillaume le Clerc’s citation of Latin names for animals without citing a source and Philippe de Thaon’s preservation of a Latin prologue and occasional Latin interpolations. Using the Onocentaur as a case study, Campbell examined Philippe de Thaon’s description, noting the sandwiching of a Latin text passage in between blocks of French text. She argued that translation was woven into pedagogical instruction, as the halved text mirrored the physical form it described (the Onocentaur has the top half of a human, but the bottom half of a beast). Building on that example, Campbell turned to the example of the hyena, which according to the bestiary can switch genders. Campbell likened the hyena’s boundary-crossing nature and physical hybridity to translation itself—an inexact and often messy pursuit that both complicates and adds to the body of knowledge on which it is concentrated. 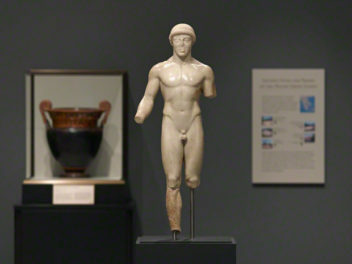 The second day of the conference was held at the Getty Center. The morning began with a special closed session in which participants discussed issues raised by the previous day’s papers while examining bestiary manuscripts firsthand. 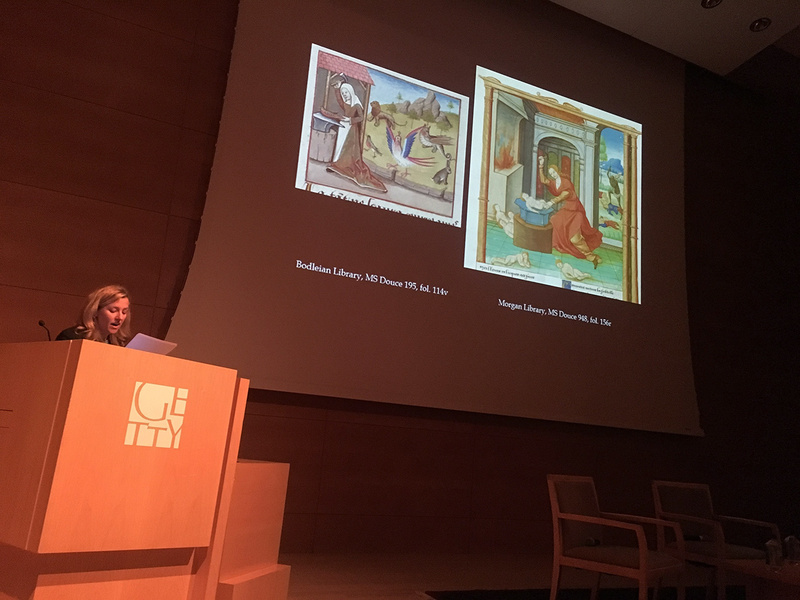 Elizabeth Morrison, senior curator of manuscripts at the Getty, gave a preview of coming attractions with a presentation about an exhibition on bestiaries currently slated for summer 2020. Presentations began with a duo of speakers who asked the audience to consider the intersections of bestiary imagery, natural history, and medieval mapping. Chet Van Duzer proposed a relationship between the catalog of so-called “monstrous races” in the bestiary manuscript Getty Ludwig XV 4 (c. 1277–1300, Los Angeles, the J. Paul Getty Museum), a small map in an English Psalter, and the fragmentary Duchy of Cornwall map. One of his most important conclusions concerned the direction of influence among these examples, suggesting that the artist of the Getty manuscript was using a map as his model. Van Duzer pointed out that one of the inscriptions accompanying the Getty illumination for one of the monstrous races reads that they can be found “in hoc loco” (“in this place”), a direction far more appropriate for a map, which orients information spatially, than a manuscript, where it has no meaning. Debra Strickland followed with another case study of the permeation of bestiary imagery on a map, this time the famous Hereford Map made in England circa 1300. Examining examples of bestiary animals scattered across various geographic locations, Strickland argued that while the map omits the Christian moralizations so central to the manuscript version of the bestiary, their spatial relationships assimilated the bestiary into a larger worldview. She considered the viewers who might have seen the Hereford map—a large, varied group of secular and ecclesiastical people, including pilgrims—and said that they would have recognized bestiary images from other contexts, but would have been encouraged to imbue them with a particularly English meaning. For example, she argued that the leopard in the context of the Hereford map took on a relationship to King Edward I and the Plantagenets, transforming into a symbol with extra-bestiary meaning. In this way, bestiary images were participants in several bodies of knowledge simultaneously. Another pair of speakers focused on the possible links between the bestiary and literary sources, specifically the Roman de la Rose, perhaps the most popular secular romance text of the Middle Ages. Meradith McMunn first examined the appearance of bestiary animals within the illuminations of the Roman de la Rose manuscript tradition. She then provided an analysis of twelve vernacular anthology manuscripts in which the Roman de la Rose was intentionally bound together with beast-related literature, including French prose bestiaries. She suggested that the binding of these different texts together in a single volume could encourage certain interpretations of the text dependent on the relationships between the Rose and the beast literature in question. The moralizing tales and animal symbolism of the bestiary could be reframed to have new meanings, sometimes taking on the character of courtly allegory so central to the telling of the Rose. Julie Orlemanski also discussed a possible comparison between the Roman de la Rose and the bestiary, this time using the appearance of the phoenix as a case study. In the bestiary, the phoenix is described as a bird that, when it reaches the age of 500 years, lights a fire and is consumed by it, only to be subsequently reborn. In the Christian context, the phoenix is an allegory of the death and resurrection of Christ. Orlemanski analyzed the appearance of the phoenix in Jean de Meun’s continuation of the Roman de la Rose, originally begun by Guillaume de Loris. In this piece of literature, the Christological connotation of the phoenix in the bestiary is stripped away and instead the phoenix presents an entrance into several different medieval conversations about the idea of “Nature” as it appears as an allegory in the text. Orlemanski argued that the phoenix usurps Nature and goes against its order, since it complicates the idea that species are always plural. Orlemanski concluded that while the appearance of the phoenix in the Rose doesn’t directly connect with bestiaries, it calls up bestiary lore and the interpretive mode that goes with it, asking readers to look deeply and assign complex meanings to animal behaviors. The conference ended with a presentation from Jane Geddes on the physical production of a closely related pair of illuminated bestiaries by religious scriptoria. Using the famous Aberdeen bestiary (c. 1200, Aberdeen, Aberdeen University Library Ms. 24, Scotland) and its closely related copy Ashmole 1511 (c. 1200, Oxford, Bodleian Library), Geddes acknowledged the notorious difficulty of determining locations of production for any Second-family bestiaries. She gradually built up a case for Bridlington Priory as a potential origin point: similar bestiary imagery in the initials of two Psalters thought to have also been produced in the area, evidence of use of the Aberdeen bestiary as a school book for teaching, textual evidence from the “Bridlington Dialogue” by renowned monk of Bridlington, Robert the Scribe, and sculptural evidence from a tomb in the priory thought to be its founder’s or his son’s. Though the evidence is largely circumstantial, Geddes built a strong case for Bridlington priory as a center for bestiary production, and further challenged the audience to think about bestiary manuscripts as objects with long histories of their own. The “Ark After Noah” symposium provided thought-provoking discussion for participants and attendees. 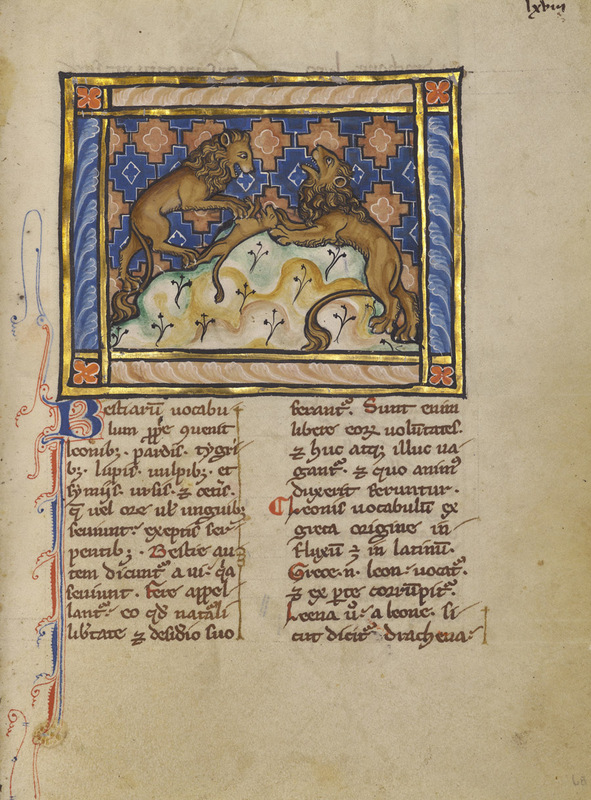 For the Getty, it also served as the prequel to an upcoming exhibition on the bestiary and the dissemination of its stories and images throughout the medieval world, scheduled for the summer of 2020. The exhibition will feature objects from across the globe from nearly forty different lenders, bringing many of the most well-known bestiary manuscripts together with objects in many different textual traditions—devotional, liturgical secular, encyclopedic, vernacular­—and media—ivory, tapestry, stained glass, metalwork, stone and wood sculpture—to show how important the book of beasts was to its medieval audience. The body of scholarly literature on the bestiary is as vast and multifaceted as the medieval engagement with its texts and images. The following is intended to highlight a brief selection of literature for general inquiry. Baxter, Ron. Bestiaries and their Users in the Middle Ages. United Kingdom: Sutton Publishing Ltd., 1998. Clark, Willene B. A Medieval Book of Beasts: The Second-Family Bestiary: Commentary, Art, Text and Translation. Woodbridge: The Boydell Press, 2006. Clark, Willene B. and Meradith T. McMunn, eds. Beasts and Birds of the Middle Ages: The Bestiary and Its Legacy. Philadelphia: University of Pennsylvania Press, 1989. Hassig, Debra, ed. Mark of the Beast: The Medieval Bestiary in Art, Life, and Literature. New York: Garland Publishing, 1999. McCulloch, Florence. Medieval Latin and French Bestiaries. Chapel Hill: University of North Carolina Press, 1962. White, Cynthia. 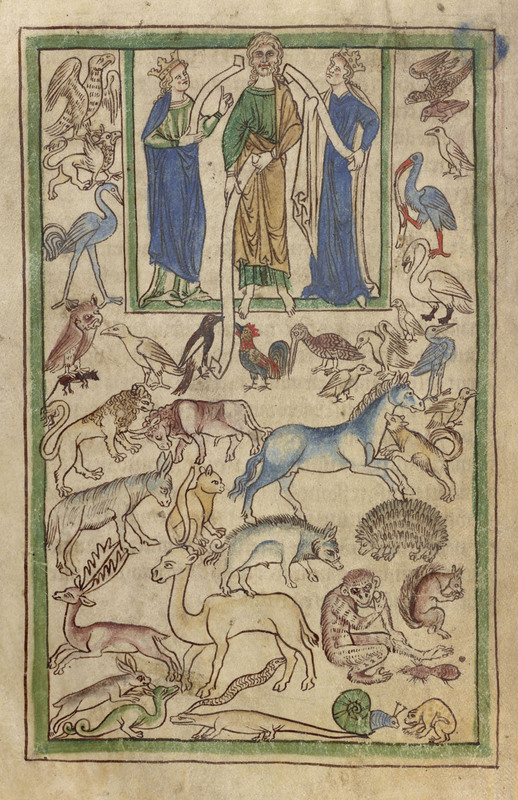 From the Ark to the Pulpit: An Edition and Translation of the “Transitional” Northumberland Bestiary (13th Century). Université Catholique de Louvain, Publications de l’Institut d’Études Médiévales: Textes, Études, Congrès, vol. 24. Louvain-la-Neuve: Collège Erasme, 2009. White, T. H. The Book of Beasts, Being a Translation from a Latin Bestiary of the Twelfth Century. London: Jonathan Cape, 1954.